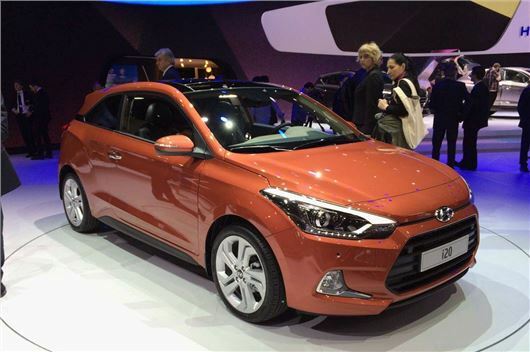 Hyundai has announced that the i20 Coupe – which will appear at the Geneva Motor Show – will cost from £12,725 when it goes on sale on March 26. Two engines are offered – a 1.2-litre petrol with 84PS and a 1.4-litre CRDi diesel with 90PS. Emissions for the petrol are 119g/km, while the diesel produces 106g/km. Economy figures are 70.6mpg for the diesel and 55mpg for the petrol. SE models come with 16-inch alloy wheels, Bluetooth, cruise control, electric windows, air conditioning and parking sensors. Sport trim adds 17-inch alloy wheels, auto lights and wipers, climate control and tinted glass. The range-topping Sport Nav model benefits from a 7-inch touch screen system with navigation, a rear-view camera and DAB radio.